Diffrient World is Humanscale's first foray into all-mesh task seating. Designer Niels Diffrient wanted to create the most minimal, full-function task chair ever made. With an innovative tri-panel mesh backrest that provides custom back and lumbar support and a lightweight design, Diffrient World is, like all of Humanscale’s products, simple, beautiful and functional. The design eliminates the need for traditional mechanisms, instead using the laws of physics and the sitter’s body weight to offer perfect recline for each individual sitter. Diffrient World offers the ultimate user-friendly sitting experience. Niels Diffrient designed Diffrient World to offer ease of use and effortless functionality. With weight-sensitive recline that adjusts automatically and armrests that are attached to the back of the chair so they move with the user for ergonomic comfort, Diffrient World provides custom comfort for every sitter. A high quality, affordable task chair with minimal parts, Diffrient World was built with longevity in mind and will look as good in ten years as it does today. Diffrient World uses the laws of physics and harnesses the user’s body weight to automatically provide the right amount of recline for every individual, every time. Its groundbreaking mechanism-free recline action leverages two parts of the chair’s frame to provide automatic, balanced support throughout the full range of motion for maximum support. Diffrient developed the chair’s back using the laws of physics, which eliminates the requirement for a separate lumbar support, which tends to create a pressure point and requires manual adjustment. With patented Form Sensing Mesh Technology, the backrest perfectly conforms to the sitter’s entire back as if custom made for them. A truly lightweight chair, Diffrient World replaces the standard cushion seat with a low-abrasion, non-stretch mesh. To maximize comfort, Diffrient eliminated the front edge of the chair, solving a perennial problem of hard edges placing pressure on the knees and contact stress behind the thighs, allowing long-term comfort and total supports for every sitter. "If every chair was made the way the World Chair was, we would cut in half all the material used for task chairs." Drawing inspiration from the three dimensional approach tailors take when creating men's suits, Niels Diffrient wanted to build a minimal mesh task chair with a back that automatically fits the user. He collaborated with textile designer Elizabeth Whelan to create a flexible but strong non-stretch mesh, so the backrest would take on the shape of the sitter. He also wanted World to be minimal but highly functional, so he worked to eliminate tension mechanisms, knobs and adjustment levers. The result is a task chair that is simple but beautiful, supporting each user instantly and changing the way people sit. Diffrient World's groundbreaking minimal form inspired the creation of the award-winning Pinstripe textile, a distinctive pattern with a unique weave that has the strength to support the sitter and the flexibility to provide complete comfort. Going along with the Diffrient Smart chair, this was the perfect compliment for my employees as I have the Different task chair. I have several offices with different color schemes. I also need to make sure my employees are comfortable and working well throughout the day. Very pleased with the options of color choices. 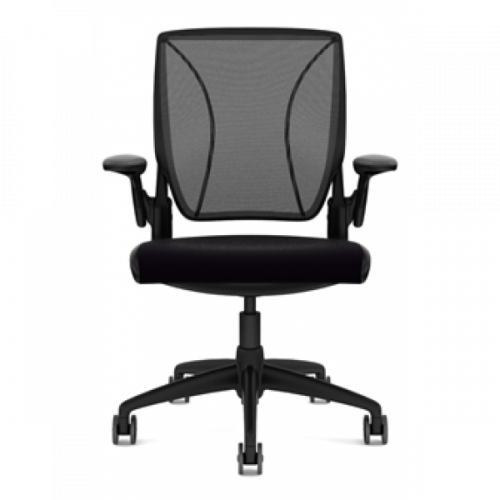 CINTOStyle, comfort and utility come together in the Cinto chair, a stackable office chair that brea.. The Allure FlexBody with Leather with a high back designer mesh is one of the leading alternatives t..